1. 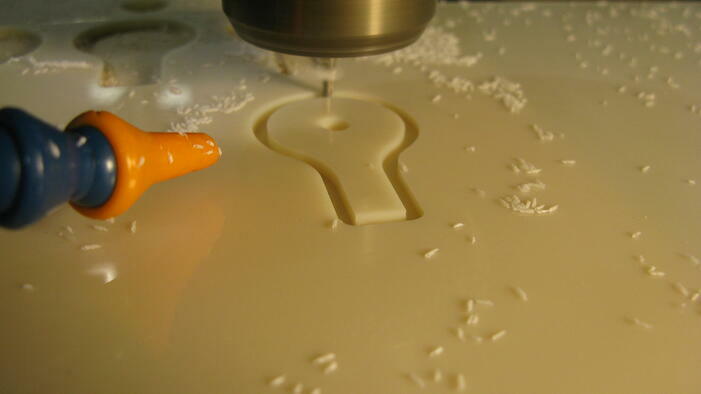 We typically operate with plastics that have significantly lower strength profiles than metal. 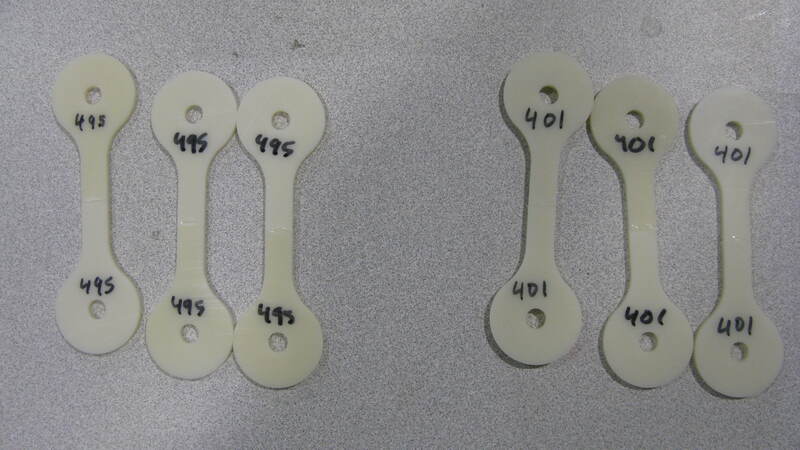 See below for dogbone specimens made of plastic and more suitable to a manual tensile testing machine. 2. Oftentimes we test the actual part as opposed to a dogbone tensile testing strip. The dogbone is intended to more objectively standardize testing for different materials but it is more accurate to test the actual product if possible rather than a dogbone of the product. We start by modeling our designs using in CAD and then compute their strength on a theoretical level using the software. For example, if we make a rope connector of some kind that is purely made out of plastic, the math behind the design will say that it will hold a specified amount of load. So let’s say the rope connector theoretically breaks at 150 pounds of force being exerted on it. Engineers, however, always have to implement a factor of safety into their products to prevent harm to the user. If we want to have a factor of safety of 3, we would advertise that the rated load of the rope connector only be 50 pounds. 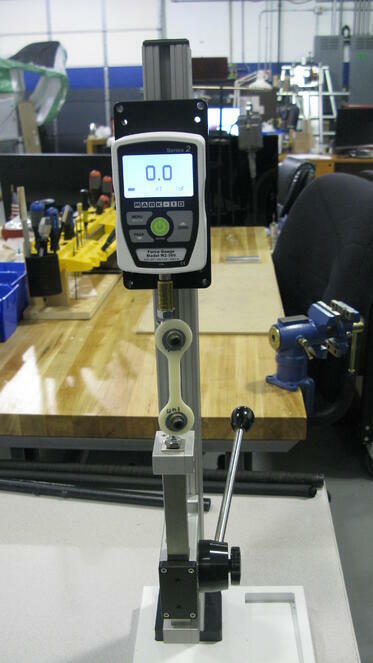 Once the prototype or the product is then physically made, we test it on the tensile tester. Since the plastic and the parts that are made for the prototype are not perfect, we expect the force that the prototype will fail at to be slightly less than the theoretical value. So instead of breaking at 150 pounds, it will break around 137 or 140 pounds. This is very much acceptable in the scope of our consumer products. Now if the product broke at 75 pounds, there is something that went wrong in either the injection molding process or the assembly of the product. Either way, the tensile testers helps us see if there is a physical problem with the prototypes. Our in house tensile tester works by using a lever arm to manually exert force on the test subject. To use it we first connect the specimen to the machine in two places: the force measuring device and the moving arm connector. We pull on the lever to exert the force through the specimen and that gets translated by the measuring device. Once the product breaks, we see take a look at the peak tension the specimen withstood prior to failure. Tensile strength testing is one of the most commonly used tests available to catalogue the material properties of new materials. In short, the tensile test is used to determine when a particular material will fail in the event that it is subjected to a tensile force (i.e. when it is being linearly pulled apart under tension). Other tests include compression strength tests (linearly pushing a material together until it fails) or shear strain tests (subjecting a test specimen to lateral, twisting forces until failure. Tensile testing is very relevant in the scientific community and amongst engineers working for companies trying to use or develop new materials. For example, a company might develop a new type of ceramic or an untested metal composite. Any time a new material comes into existence it’s important to ascertain its material properties so as to determine which applications it will be useful for and which it will not. In order to test the material in tension it will typically be molded into the shape of a “dogbone” (see photo below). The dogbone shaped material is sometimes referred to as a tensile bar. You’ll notice that sometimes the tensile bar has threads at the end while at other times it does not. This simply indicates the fitting used in the particular tensile testing machine. Some machines clamp the specimen while others thread it into a female connector. For steels and ceramics, a motorized tensile tester is usually used because of the vast strengths of metals and ceramics (stressing the material to failure requires more than can be done with a hand lever). The machine then stretches the material until it breaks. See below for a visual of different specimens and their failure characteristics at different temperatures. Note in the image above that the metal tends to yield (stretch) more at higher temperatures before it fails. Contrast the specimen tested at 250℃ as compared to the one tested at 25℃. The specimen tested slightly above room temperature (approximately 25℃) exhibited a brittle failure (i.e. it failed all of a sudden). It did not stretch nearly as much prior to failure as the specimen tested at 250℃. In testing materials it’s important to understand the way in which data is recorded and interpreted by engineers. 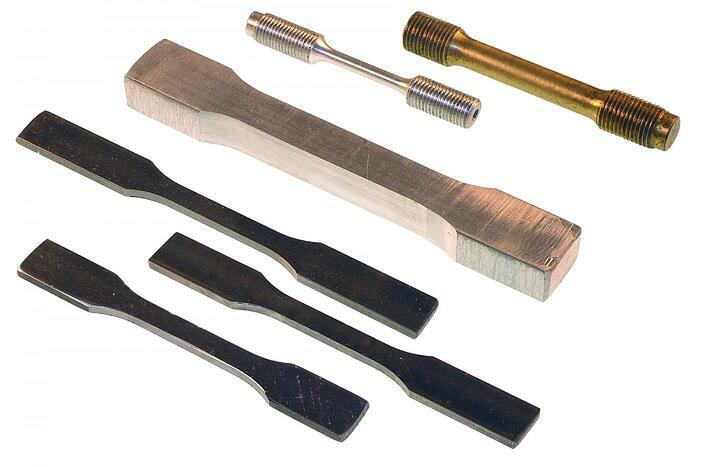 Most tensile tests produce a well known chart called the stress-strain chart for the material. The chart has two axes: x (which signifies the stress applied by the machine to the material (“dogbone”) being tested and y (which signifies the strain or the amount of linear stretching or deformation the dogbone exhibits at a given level of stress). Stress is represented by the lowercase Greek letter “sigma” (σ) while strain is represented by the lowercase Greek letter “epsilon” (ε). The amount of stress a given material can withstand is basically the pressure it can undergo without failing. 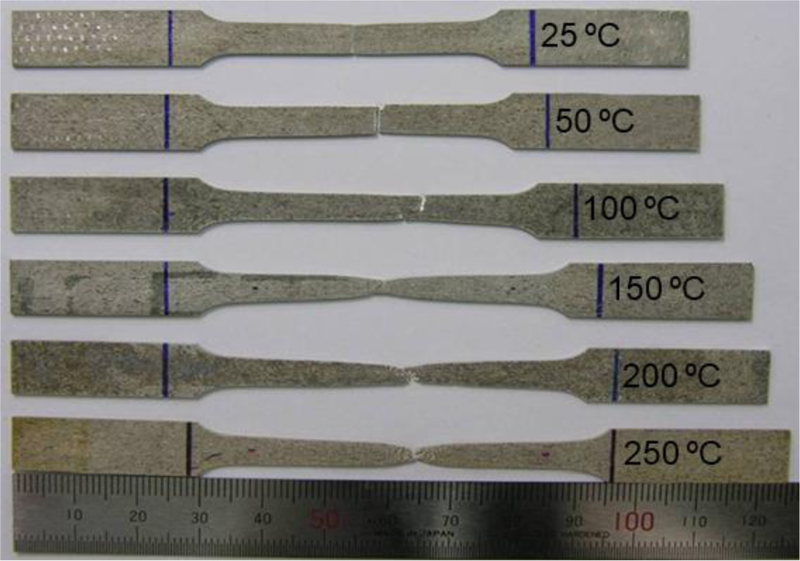 The amount of strain the material can withstand is basically the amount that it can stretch before it fails (also called the ductility of the material). So initially as pressure is applied, the stress and the strain are linear because the entire length of the dogbone is taking the pressure uniformly. At some point the material will have so much pressure applied that if anymore is applied it will begin to permanently deform. This is known as the “yield strength” and is signified by position (1) on the chart above. Once the material hits the yield strength position the entire material begins to uniformly stretch similar to the way taffy would react to stretching. 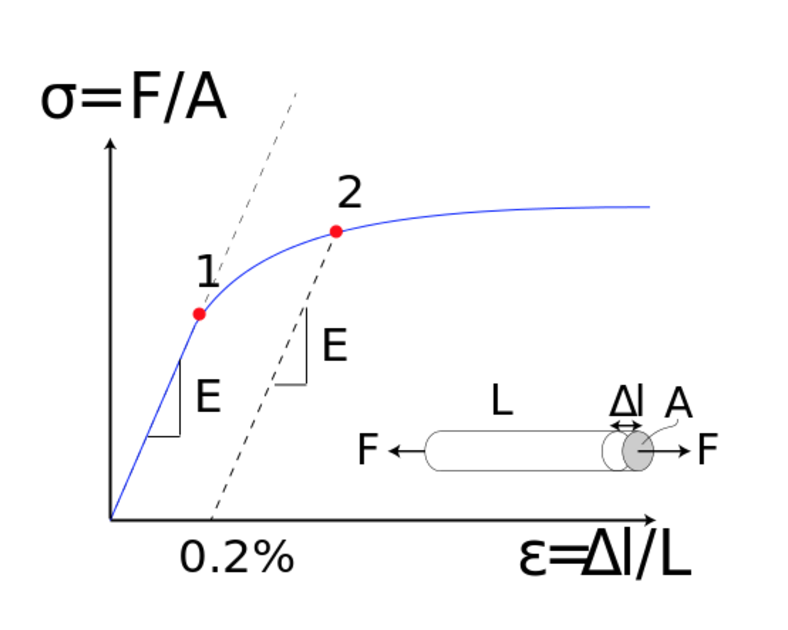 This behavior continues while additional pressure is being applied until the material reaches its “ultimate strength” (the maximum pressure that can be applied before total failure). Once it hits the ultimate strength the material would start to neck and fracture in a single location (see below). Once the material breaks the test is complete and the data points are reviewed.